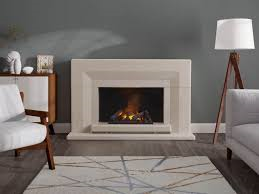 Limestone surround with black granite chamber to reflect the flame effect. Flame effect can be used independently of the heater which has 1kW and 2kW settings. Thermostatic control to create and maintain a comfortable temperature in the room. Fits on a flat wall no opening required.